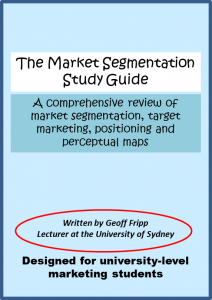 This website has been primarily designed to assist marketing students and marketing practitioners to quickly and easily understand and create perceptual maps for marketing. I hope that you find the spreadsheet templates easy to use, as well as being a big time-saver. If you have any questions, you can email me. Perceptual mapping is a technique that essentially visualizes the core marketing activity of segmentation, targeting and positioning (which is often referred to as the STP process). I have an eBook available in PDF that reviews these important topics for just $6.99. Click the book’s image to learn more.